The Husky Ride- When My Hands Almost Froze! sounds like fun. Could u pet the dogs? Btb do watch the movie- 8 below to understand more about these dogs. Thank you Gaurab. I have seen that movie but maybe I need to watch it again. Seeta the same is true for me but as I was invited and my hosts arranged for it, I just went with the flow. Mridula – Appears, like you had some interesting time. Ride on dog sledges has been a dream for me and my husband. Hope you do it soon Prabhjot. Amazing post , Thanks for the video. The video is good but I could not stop the pain even at the end of this. I think the dogs suffer a lot as at the end I saw some of their faces. What is the distance traveled. The distance was short. I am not sure about the suffering part, I hope that is not the case. Oh! 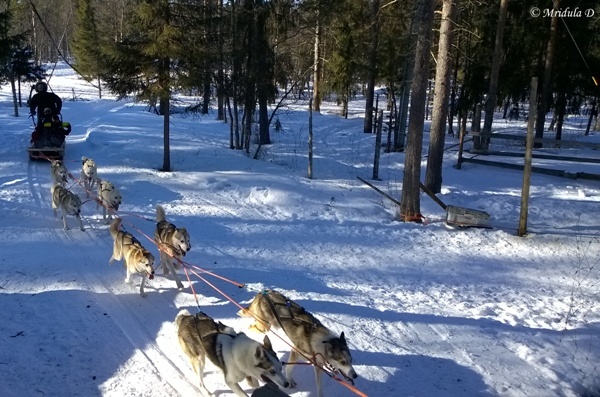 I didn’t know something like Husky Dog Sledge Ride is there! Thanks for this post! I hope you enjoyed it Sindhu. Mridula you are a lucky women. I love snow and adore those doggies. Can we get a dog sledge ride in India. I wish we could. It was wonderful reading your experience, you seem like a fun person/blogger.